So you have decided to hatch some chicken eggs and keep chooks. Whether you are doing it for purely utilitarian reasons, educational reasons or because you have a terrible chicken addiction (I may possibly fall into this last category) there are a few important basics to get your head around. To hatch eggs you are going to need either a reliable broody hen or an incubator. Sadly Barnevelders, despite being the best chickens in the world from every other perspective, do have the slight failing that they do not have a great propensity for sitting. Consequently I hatch most of my eggs in incubators, although I am trying to breed some mothering back into my trusty Barnies. If your hens are not good sitters you can get in a hen or hens for the purpose of sitting otherwise it’s incubators. The very silly looking Silkie chickens are excellent sitters, but their extremely docile nature can mean they get bullied by other birds. There is no way to make a hen go broody. Locking her in a box with eggs will not make her sit. Don’t do this. However if a hen is broody when you don’t want her to be you can put her in a cage with the wire side under her and hang it up. Because she can’t make it warm underneath her she will give up after two or three days. One of the most common questions I am asked is how one knows if a hen is really sitting or if she will give up. The truth is one never really knows, though if a hen has successfully sat before she is more likely to stay sitting. Once the hen has been sitting for three days she might be broody. Put your hand near her head and see how she reacts. She may make a low trilling noise as your hand approaches or she may peck you. If she does both of these things then she may well be serious. Don’t worry if she is sitting on eggs that are not the ones you want to hatch. Once you have ascertained that she is serious you can easily swap these eggs for the ones you want her to incubate. The best time to swap eggs is at night. Chickens’ brains go into neutral in the dark so they are much less likely to react to your actions at night. To swap eggs first make sure the eggs you are going to put in are not freezing cold. Is she is serious she will have pulled feathers out of her breast to make a bare patch so that the eggs have good contact with her skin to keep warm. She may well reject cold eggs, pushing them off the nest. A sitting hen needs a nice dry, secure location to sit. It should be rat, snake and other vermin proof. Nesting boxes in the hen house are a good option as then the hen will still benefit from the protection of her vigilant bloke, should she have one. Nesting boxes should be placed lower than roosts as otherwise non broody birds will try to roost in them in their quest to be roosting highest. However they should not be placed underneath where other birds roost or they will soon become contaminated with manure. If a hen pushes eggs out of the nest it is most likely because the eggs are rotten so don’t go putting them back under her. It is also vital that a broody has excellent pest control. She is literally a sitting target and will accumulate a lot of insect pests if you don’t take care. Plenty of Diatomaceous Earth is the best thing. See this post for information on what it is and how it works. There are some drawbacks to having a broody in the house with other hens. Hens may try to steal eggs from under a broody or they may try to usurp her nest. This results in eggs being damaged or not being continuously sat on and thus the incubation temperature not maintained. For these reasons you might like to make your broody’s spot inaccessible to other hens. If you are going to enclose your broody remember that she needs enough space to get off her nest to toilet and to eat. You want her to be toileting as far from the nest as possible in order to avoid contamination of eggs, which can result in rotten eggs. She should get up once or twice a day but she won’t stay up for long as the eggs will soon get cold. Because they don’t get up for long it is important to provide sitting hens with excellent quality feed. A good grain mix is essential, as are green vegetables, spinach is excellent. Because hens lose a lot of weight while sitting, foods that are high in fat are also a must. I feed mine bacon with plenty of fat on it. Having high quality food available at all times in one reason you need a vermin proof enclosure. Chicken eggs take 21 days to incubate, however development doesn’t start until the eggs have been at the right temperature for at least 16 hours. Incubation time is affected by temperature. If it has been very cold the eggs will hatch a bit later and vice versa if it has been very hot. Don’t panic if you haven’t seen any chicks after 21 days. The very worst thing you can do is disturb the hen to look. Once the chicks do hatch they will not come out from under their mum for at least a full day. In this time they dry out and recover from the very hard work of getting out of their egg. They don’t all hatch at exactly the same time so the hen won’t move until as many as she thinks will hatch do so. If there is no sign of chicks after 25 days then is the time to investigate. At night, take the eggs out and shine a strong light through them, making sure you keep them warm while you do so. This is easily achieved by placing the egg on the end of a toilet roll and shining a light through the roll in a dark room. You should be able to see a big air bubble at the blunt end of the egg while the rest of the egg is opaque. If you don’t see this then the eggs have not developed. If the entire egg is dark the egg is probably rotten. Do not let your hen sit for longer than four weeks. If the eggs haven’t hatched by this time they never will and the hen can die of starvation if she remains sitting. She will need a good month to regain her normal weight before she can sit again. Sadly hens are often more determined to sit than aware of this fact so then it is necessary to take matters into your own hands and put her in the hanging cage. Once your eggs have hatched the chicks will need good quality food. They don’t eat for at least 24 hours after hatching as just before they hatch they absorb the remaining part of the yolk and this feeds them for that time. After that they need green food immediately and a good chick starter as well as fresh, clean water. I always put crushed, dried chilli, whole garlic cloves and apple cider vinegar into all my birds’ water. You need to get a good cider vinegar that says “with the mother”. The mother is the active part of the vinegar and vinegars without this are lacking the necessary nutrients. About a teaspoon of chilli, one clove of garlic and 20mls of apple cider vinegar per 5 litres of water is all that is required. Making sure these are in your birds’ water will help to avoid disease outbreaks. I eat my birds and so I use Tasmanian Seedhouse starter as it is the only one available here that doesn’t have medication in it. Unless one is crowding a lot of birds into a too small space, or not practicing good hygiene one is unlikely to actually need this medication. If you can’t find a chick starter that doesn’t have medication look for a game bird starter as they often don’t have medication. Once the chicks are able to be out foraging with their mum they need protection from predators that allows them access to green food as soon as possible. I keep mine in netted yards until they are twelve weeks old or they get gobbled up by hawks, owls and eagles. Birds raised by a hen really do do better than those raised in incubators. I suspect this is because they learn to eat a wider range of foods. Incubator raised birds often have to be taught to eat slugs and snails for example. If they don’t encounter these nutritious treats when they are first learning to eat they don’t seem to learn that they are food. They will eventually learn to eat them if put with other birds that eat them but having a good mum is vital to success! This entry was posted in Uncategorized and tagged Chickens, Chooks, Hatching, Incubation, Poultry by Morgan Leigh. Bookmark the permalink. Very interesting stuff – not that I’m planning on hatching chicken eggs or keeping chooks, but it’s really good to know the details of how it’s done. 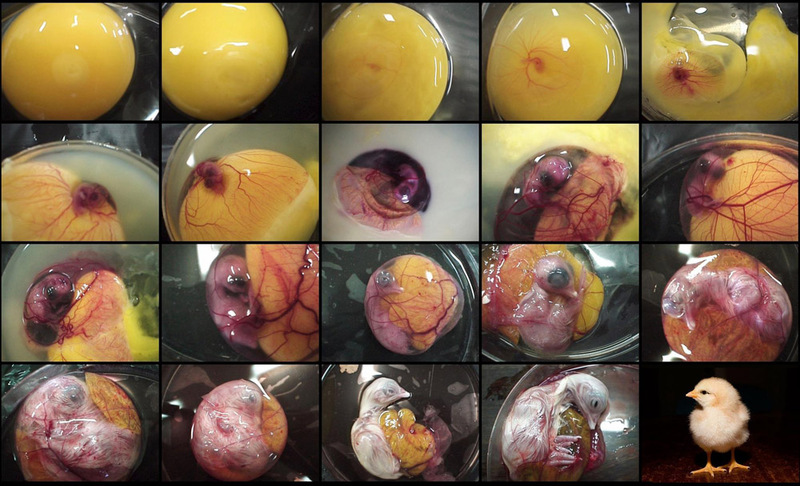 Nice chick-embryo illustration, too. great post! when can we expect more like these? It is not a good idea to let her sit so long. Hens lose a large percentage of their body weight when they sit because they hardly eat. It would be best to take the eggs out from under her and give her a rest and let her recover her weight before she sits again. If she is a determined sitter, and if you can find some day old chicks, unlikely at this time of year, you could put them under her at night. My neighbor has free range chickens and we found a nest of eggs in the Pines between our properties, 2 actually. One has 12 eggs, the other has 10. I keep checking to see if a hen is laying on them or adding any eggs. I have noticed no action whatsoever in days. Does this mean she abandoned the nest or can she still come back to hatch them. Also, can we try to hatch them, maybe in an incubator or are they ruined? Thanks! Sounds like someone laid and ran. I suggest you collect the eggs and float them to see if they are still good. Put them in enough water to submerge them and if they float it means they are rotten. If they lay flat on the bottom they are super fresh and if they stand on one end but don’t float they will also be fine. Then you can put them in an incubator as they don’t start developing until that have been at the right temperature for at least sixteen hours. Do let me know how you go. I have a couple pair of guineas tha roost in my chicken coop with my chickens is this alright or do I need to build a separate coop for them? I know of no reason why they won’t be fine together. We have a “rescue chicken” who started laying at my husbands work. We brought her home and shes been sitting the whole time. We do not know how long shes been sitting or if the eggs are fertalized. Two days ago was our best guess 21 day mark. How long do we go before we are sure no babies will come? How do we get her laying again? If you are not sure if the eggs are fertile or of how long it has been you can candle the eggs. At night, in a dark place, get an empty toilet roll and a strong torch. Put the egg in one end of the toilet roll, pointy end in. Shine the torch through the other end making sure no light leaks from the torch end. If the eggs have not developed they you will be able to see inside them and it will be clear. If they have developed you will see something inside the egg. You might see it moving. If the eggs are really opaque with a clear area at the blunt end then the egg is really well developed and could hatch at any time. It can take up to 25 days for chicks to hatch depending on the ambient temperature. The colder it is the longer the time. If the eggs have been mostly opaque with a clear area at the blunt end and ten days pass, then the eggs are probably not going to hatch. Carefully open one egg by peeling the shell back a bit. If it bleeds when you take the shell fragment off then the embryo is still alive and might still hatch. If it doesn’t bleed keep opening the egg until you can see inside and see if it is alive or not. If the eggs are all clear or you have determined they are dead then remove the eggs from the hen and compost them. Make it so she can’t get to the spot where she was sitting. If she sits somewhere else then you will have to put her in a hanging cage so that there is air under her. Leave her there for two days. Provide her food and water obviously. Once you take her out of the cage she should not sit. If she does, stick her back in the cage a bit longer. The reason for this is that if there is air under her she won’t be able to keep it warm enough for eggs and she will realise she is wasting her time. My broody hen has been sitting on her eggs for 21 days today. When my husband went to go feed everyone this morning he said she had moved all of the eggs out of the nest, she had made a nest on the coop floor under the bottom row of nesting boxes. What should we do? If she is still sitting on the eggs just leave her where she is. Trust her. She knows what she’s doing. I have 2 broody chickens, one of them has laid its egg in a cardboard box outside the cubby house.. its a very awkward spot and the box is slightly tilted so everytime my chicken leaves the box to eat or stretch some eggs roll out with her..
ive put them back every time but i am scared that they arent ok? i went back outside to maybe position the box differently but now she isnt going anywhere near the box..
is it too late for the eggs because shes been off them for a bit over half an hour? is it possible to move the eggs to my other broody chicken and put them under her? please help as im new to this and im very concerned. ok so she just went inside the new box with her eggs.. and tried putting the eggs underneath her but then she gave up and left the box..
My chicken has finally got inside the box but an egg rolled out, so i once again panicked and put the egg back in the box as close to her as i could. will she eventually reposition herself so the egg moves underneath her? Chooks can be off the eggs for about twenty minutes to half an hour with no damage to the developing chicks inside, longer on warm days. If she’s on the ball she will roll the egg you put near her back under her. But you can also put it right under her yourself. She might peck at you because she’s broody, but she can’t damage you much, so just let her peck you and put the egg right under her if she hasn’t already done so. If she does decide to give up on brooding and gets off the eggs you can absolutely put those eggs under another hen. Just be sure to not put too many eggs under any one hen or otherwise she won’t be able to cover them all. A regular sized hen can safely sit on a dozen eggs, smaller hens less, bantams not more than six. You will just have to wait and see how they turn out to find out if the eggs are ok.
My Hen laid nine eggs but on different occasions,she has hatched three and stop sitting on the remaining eggs,am confused because all these while she has been sitting on the eggs for over two weeks plus,what do I do. This can happen. Eggs don’t start to develop until a hen has been sitting on them for at least 16 hours. This is because she will lay one a day until she has enough. She doesn’t want them to all start developing until she is sitting full time because if they started and then she got off the eggs would die from cold. It also means that the eggs should all hatch around the same time. However if it was too long between when she laid them and when she started to sit they will not develop. Also sometimes other hens will lay eggs in the nest of an already sitting hen. These eggs will then start to develop but they will be due to hatch later than the others. The hen can tell which eggs are alive and which aren’t. Once chicks start to hatch the hen will remain on the nest until they all hatch. This can be a problem because if the eggs hatch over too long a time then she will remain sitting on them rather than looking after the newly hatched chicks. If the eggs are rotten or not alive she will just get up. Once she has been off the eggs for about 30 minutes, depending on the weather, those remaining eggs will die from cold. So if your hen is up and about with her hatched chicks then just remove the remaining eggs from the nest as they won’t be going to hatch. My first ever broody hen is a bantam sitting on 12 eggs. She’s high up on a cabinet. We tried moving her last night to a nesting box where it seemed safer for the chicks, but it seemed she wasn’t sitting on them this morning. We moved her eggs back to the cabinet and she started sitting again. One hatched today and we found the almost dead, wet chick on the ground. We put it back under her but she tried pecking it. What should we do? Did she kick it out because it was ill? I’m sorry to be the bearer of bad news but it sounds like you may have done the wrong thing here. If you moved her and the eggs and came back this morning to find her not sitting on them they may be dead as they would have got too cold overnight without her sitting on them. That one hatched means there is some hope that others might hatch. Remove the chick she is pecking immediately or she will kill it. She has decided she doesn’t want it and you will have to take care of it if it is to survive. It needs to be kept warm. Put it in a box and use a light bulb to keep it warm. You need one of the old kind of incandescent bulbs as the modern fluorescent ones don’t put out heat and won’t work. In an emergency you can use a hot water bottle, but that won’t work for long so you will need to find a way to keep it warm in the long term. Just put it in the box with the chick and it will find its own comfortable position. The idea temperature on day one of hatching is 35 degrees. It won’t need any food for about 24 hours. By that time you will see if it has perked up and is going to survive. If you need to move a broody hen the way to do it is to move her in the middle of the night and make sure she can’t get back to where she was originally sitting. Check on her 15 minutes after moving and see if she is sitting on them. If she isn’t shes probably not going for it and your best move is to put her back and then move her after the chicks hatch. I have a hen who has been sitting on three eggs. On day 18 one of the eggs disappeared. On day 20 another disappeared. Today the third egg hatched and the chick looks healthy. I am just wondering what happened to the other eggs? She has been in an enclosed area and not around the other hens? My guess would be someone is stealing the eggs. The most likely culprit is rats, who can get in through a tiny hole, but also snakes or Ravens will steal eggs.